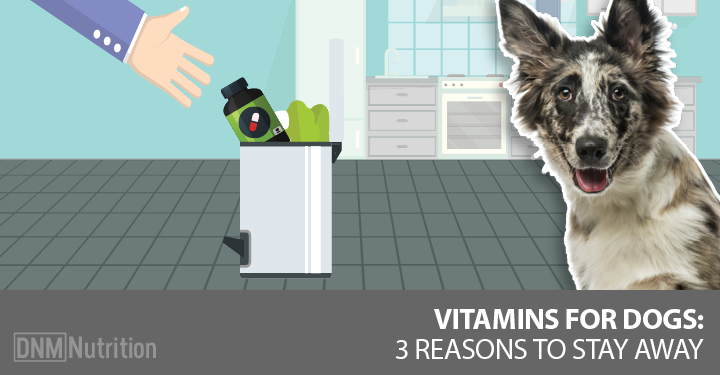 If you think these are great reasons for your dog to get vitamins and supplements, you’re not the only one. In 2014 pet owners spent $541 million on supplements alone … and that number is expected to be nearly $700 million in 2019. … because there are three important reasons why vitamins might not be a great idea. Most people think vitamins are natural. But most of the vitamins you’ll find in your dog’s supplements or food are made from waste products from the petroleum and coal industries and hydrogenated sugars. There’s really nothing natural happening here! The truth is, vitamins are often made from these industrial waste products simply because it’s cheaper and because they last longer than the vitamins found in real foods. This means they can sit on shelves for months or years and can also be added to foods in super high doses. But these cheap synthetic vitamins probably aren’t giving your dog the benefits he needs. Synthetic B-12 is made by combining cobalt and cyanide (yes, cyanide). Do Man-Made Vitamins Work The Same As Real Vitamins? Naturally occurring vitamins and synthetic vitamins are different … really different. They’re not in the same chemical form and your dog’s body will have trouble recognizing and using the fake, synthetic vitamins. There are many studies showing that synthetic vitamins aren’t as bioavailable (which means your dog can’t use them like real vitamins from food). This means most of the synthetic vitamins you put into your dog aren’t recognizable by his body and so they’re treated as toxins and excreted from the body (this is why your pee is yellow and smelly when you take vitamins … it’s detoxification). This is hard on your dog’s kidneys and, over time, they can burn out. So next, let’s look at some vitamins and compare them to their natural, food-based counterparts. Natural vitamin A appears in food as beta-carotene. Your dog must then convert this to vitamin A. This is good because vitamin A is toxic in large doses and beta-carotene regulates how much the body converts. Clinical trials show that high doses of vitamin A can increase mortality. Synthetic vitamin B-6 isn’t easily absorbed or converted and can even inhibit the action of natural B-6 in the body. It also carries side effects not seen in food-based B-6. This vitamin appears in food as folate and is very important for DNA health. It’s especially important during pregnancy. Synthetic B-9 is called folic acid. A 2004 paper from the British Medical Journal confirmed folic acid is unnatural and the body can’t fully convert large amounts of it into usable folate. The synthetic, artificial vitamin can be absorbed however, and this may carry unknown negative consequences. This vitamin is naturally created by micro-organisms like bacteria in the soil or intestines, as well as in some algae and seaweed. Synthetic B-12 is made by combining cobalt and cyanide (yes, cyanide). Researcher Victor Herbert claims “the efficacy and safety of the vitamin B12 analogues created by nutrient-nutrient interaction in vitamin-mineral supplements is unknown.” Synthetic vitamin B-12 can also cancel out natural vitamin B-12 activity. Ascorbic acid is a chemical isolate that lacks the flavonoids and phytonutrients that make real vitamin C work in the body. Real vitamin C can also repair oxidative damage in the body but synthetic vitamin C can’t. You may be trying to avoid Chinese ingredients for your dog. And that’s an excellent idea because China has a terrible track record when it comes to food safety … in 2007 alone, synthetic vitamin premixes from China killed over 4,000 cats and dogs. Yet China owns over 90% of the vitamin C market in the US and most of the vitamins in dog foods are manufactured in China and India. This should worry you because only 2 percent of all imported vitamins are inspected. And China’s top vitamin and supplement producing areas are among the most polluted in the world. So synthetic vitamins aren’t a good choice for your dog. That’s obvious. But nearly all pet supplements and foods contain them. So how do you avoid giving your dog synthetic vitamins? First, pay attention to the food you’re feeding your dog. Nearly every commercial pet food, even some raw diets, contain synthetic vitamins. In fact most kibbles and canned foods rely on synthetic vitamins for your dog’s nutrition. Here’s an ingredient label from a “natural” kibble … you can see that it’s fortified with synthetic vitamins. Look for the same on your dog’s bag or can of food … and if you see these chemicals, look for a food that doesn’t contain them. Here’s an ingredient label from a kibble that doesn’t rely on synthetic, chemical-based vitamins for its nutrition. That’s a pretty short list. 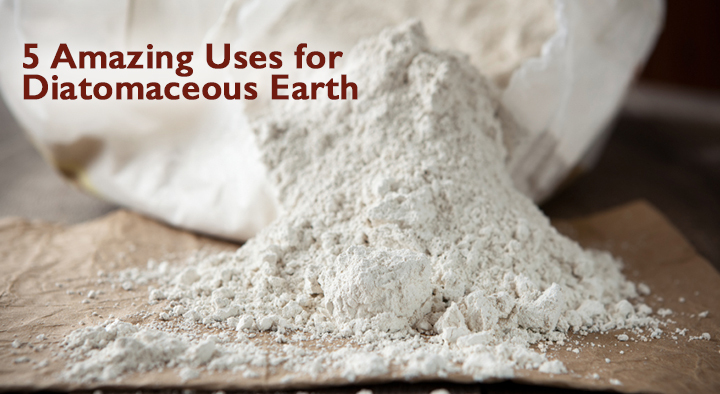 The rest of the hundreds of commercial foods all rely on synthetic, chemical-based nutrition. 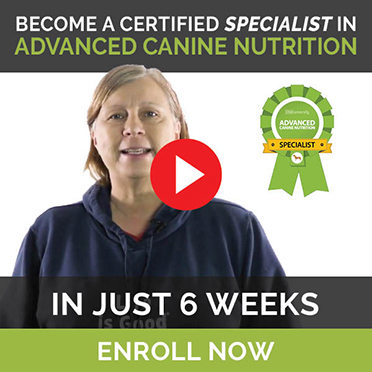 There are also quite a few raw foods that contain whole food vitamins, along with important cofactors and critical phytonutrients that make them useable and safe for your dog. If you’re giving your dog a supplement, these are also commonly loaded with synthetic vitamins. Look for a supplement that includes whole food vitamins instead of their synthetic counterparts. You can tell by looking for the synthetic names above. If the label looks like it has chemicals on it, then they’re chemicals! These fake vitamins, even if they say they’re vitamins, are chemical isolates, most likely manufactured from petroleum and coal tar waste. There are many other healthy supplements that use herbs and natural products instead of synthetic vitamins … now that you know what to look for, you’ll be able to tell, just by looking at the label. In summary, researchers don’t know all that much about how synthetic vitamins work in our dogs’ bodies and there’s even research showing they can cause health issues and even premature death in your dog.